After a week of living on a frugal diet of bacon, cabbage and lentil soup and bubble and squeak, I splashed out and bought a fiver worth of our sustainably farmed local Exe river mussels from the mobile fish man in a van. I adore Belgian moules et frites and the unctuous mayonnaise to dip the skinny chips in. Actually, I adore pretty much any variation of mussels, be they spiced with Thai notes like chillies, galangal, lemongrass and coconut milk, or even a light Roquefort liquor with white wine and just a smidgeon of cream. 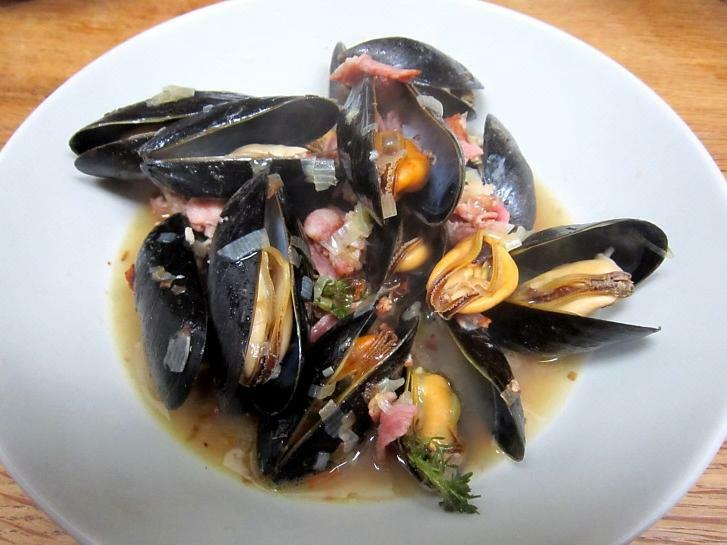 I still had scraps left from the bottomless bag of bargain bacon offcuts and a flagon of scrumpy – I am in the Westcountry, after all – so went for the exemplary flavour fusion of buttery leeks, crispy lardons, aromatic cider and thyme, not forgetting the plump, juicy mussels. Sure, you could simply serve this with a rustic loaf to mop up the juices, but why not go all out and fry some frites (in my amazing non-stick frying pan that allows me to use just a tablespoon or two of oil), adding a teaspoon of Dijon mustard to the dipping mayonnaise. It was scrumptilicious indeed. INSTRUCTIONS: Heat the oil in a heavy based non-stick pan with the rosemary and garlic clove and fry the chips (skin on or off as you prefer), tossing more frequently towards the end of cooking time. Mine took about fifteen minutes to achieve the desired crispiness. Meanwhile, fry the lardons in a drizzle of oil in a big lidded saucepan, until just starting to brown and add the leeks, bay leaf, thyme, and a small knob of butter. Cook for another couple of minutes until the bacon is turning crispy at the edges and the leeks are softened. 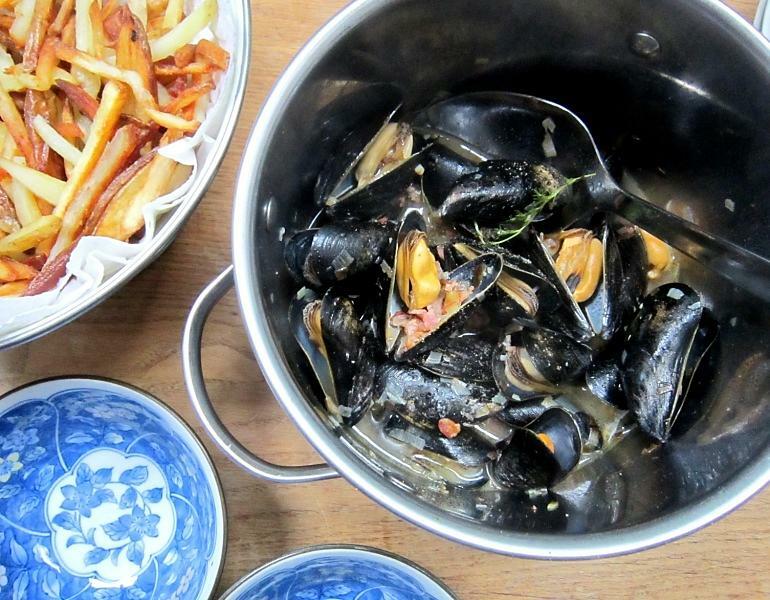 Pour in an inch or two of cider (the exact amount will depend on the size of your pan), remembering you are steaming the mussels not poaching them, so only the bottom layer of mussels need be immersed. 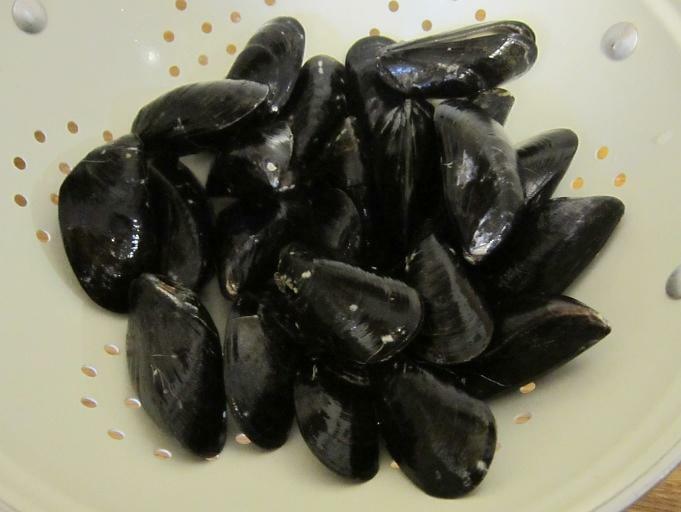 Bring up to a boil and add the rinsed and de-bearded mussels. Most supermarkets/fishmongers have taken care of the cleaning for you already, but if you find the odd barnacle just scrape it off the shell. The mussels should be alive. If one is open, pressing the shell together should make it clamp itself shut. Pop the lid on and steam for 2 to 3 minutes, until the mussel shells have all opened, discarding any which haven’t. Check for seasoning but it probably won’t be necessary thanks to the saltiness of the mussels. Heap the mussels and chips onto plates, add a bowl for the discarded shells and mix a teaspoon of mustard into two tablespoons of mayonnaise and enjoy, with another glass of cider of course.